Last week, the Associated Press reported that Abrams officially ended her campaign, but for Abrams, to concede would be to legitimize the process that allowed Brian Kemp—now governor-elect—to use his position as Secretary of State to purge nearly 700,000 people from voter rolls and suppress the vote of black and brown voters in the state. Abrams was approximately 60,000 votes shy of victory in the tightly contested Georgia race. It was a race marred by racist robocalls, Kemp’s outdated and bigoted campaign ads, a last minute court order to reinstate the right to vote for more than 3,000 people Kemp previously purged, and an election day that was riddled with broken machines and extending voting hours. It was dysfunctional from start to finish, but Abrams refuses to give in to the chaos. She still has work to do. Abrams said she plans to file a federal lawsuit against the state of Georgia for the “gross mismanagement” of the gubernatorial election and to “protect future elections from unconstitutional actions.” She also announced the launch of Fair Fight Georgia, a non-profit organization Abrams says will “pursue accountability in Georgia’s elections and integrity in the process of maintaining our voting rolls.” And while Abrams plans to spend the next year as a private citizen, she says she’ll run for office again in the future. Abrams, who announced her candidacy in June 2017, previously spent a decade in the Georgia House of Representatives, where she was the house minority leader since 2011. She ran an unapologetically progressive campaign, championing Medicaid expansion, affordable child care, gun reform including universal background checks, affordable housing, and criminal justice reform. Kemp ran on restricting abortion access, letting gun owners conceal and carry handguns without a permit, and “rounding up” undocumented immigrants in his truck. Abrams enjoyed a slew of endorsements, from Planned Parenthood and the Sierra Club to former presidents Jimmy Carter and Barack Obama. Obama stumped for her on November 2. She was also joined by Oprah Winfrey on the campaign trail in the week leading up to the election; Winfrey even canvased for her door to door. 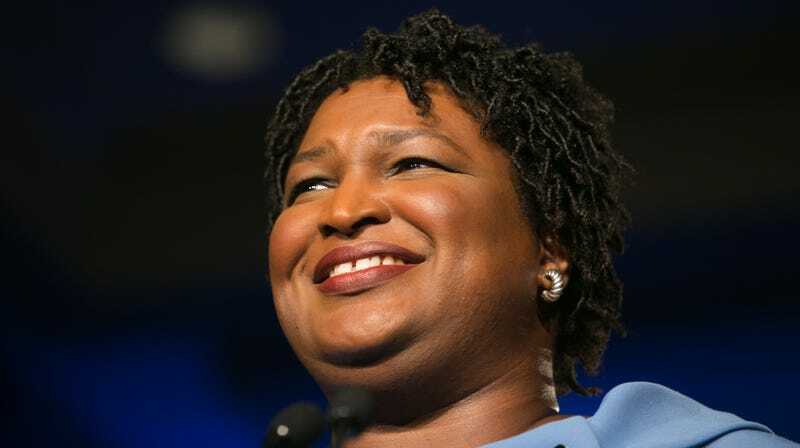 Abrams would have become the first black woman governor in United States history. Georgia is, instead, stuck with Kemp, a Trumpian nightmare. Abrams acknowledged that some of her critics would prefer that she offer a traditional concession speech, with a gracious congratulations to Kemp and a well timed smile or two, but she argued that now is not the time for empty niceties. Kemp’s tenure as Secretary of State and his campaign for governor were at attack on the right to vote. Abrams is ready to keep fighting. “Stoicism is a luxury and silence is a weapon for those who would quiet the voices of the people,” she said.